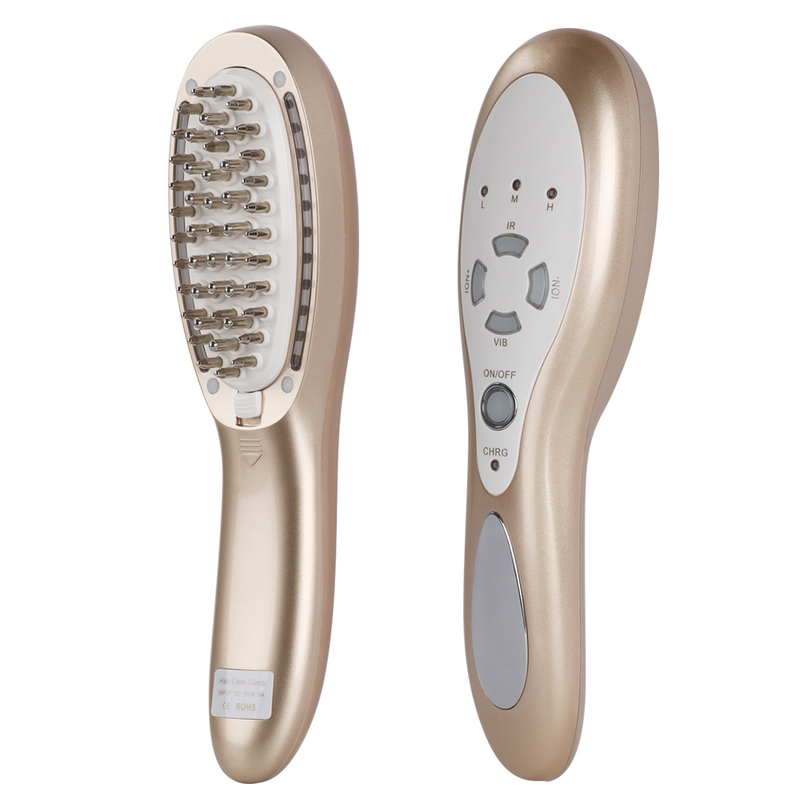 Red wave: It has strong function of cells activation, metabolism strengthen; it can prompt the shedding of the dead cells and regeneration of new cells. 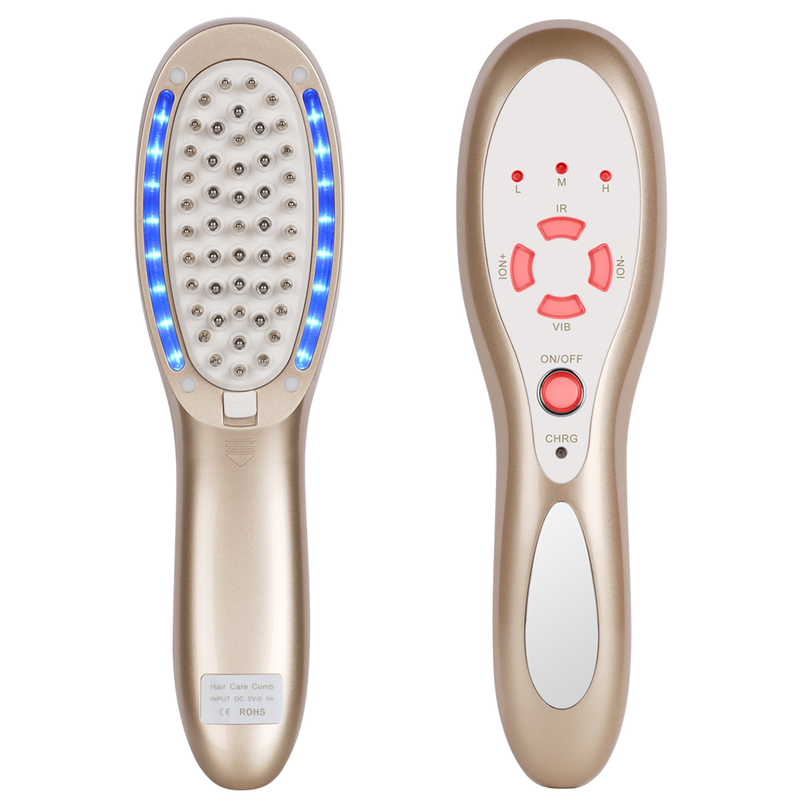 Blue wave: It has relaxing effect and function to relieve pain, decrease the overfull erythrocytes, ablate tissue congestion and enhance lymphatic system. 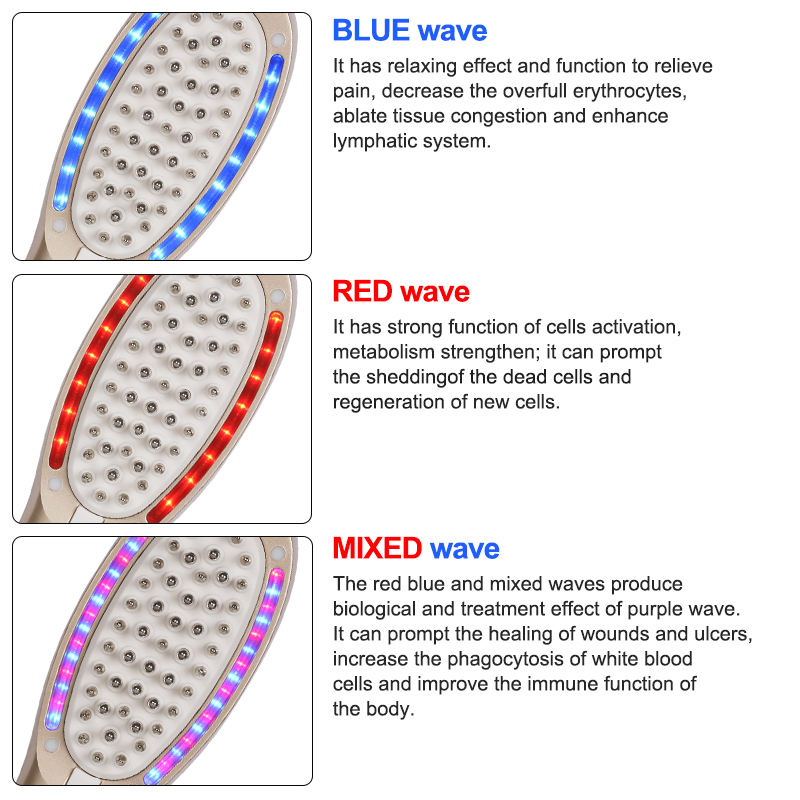 Mixed wave: The red blue and mixed waves produce biological and treatment effect of purple wave. It can prompt the healing of wounds and ulcers, increase the phagocytosis of white blood cells and improve the immune function of the body. After the ball touches the scalp, the nurturing liquid (or other liquids) will flow out to the scalp. The liquid flows evenly from many rows and holes. 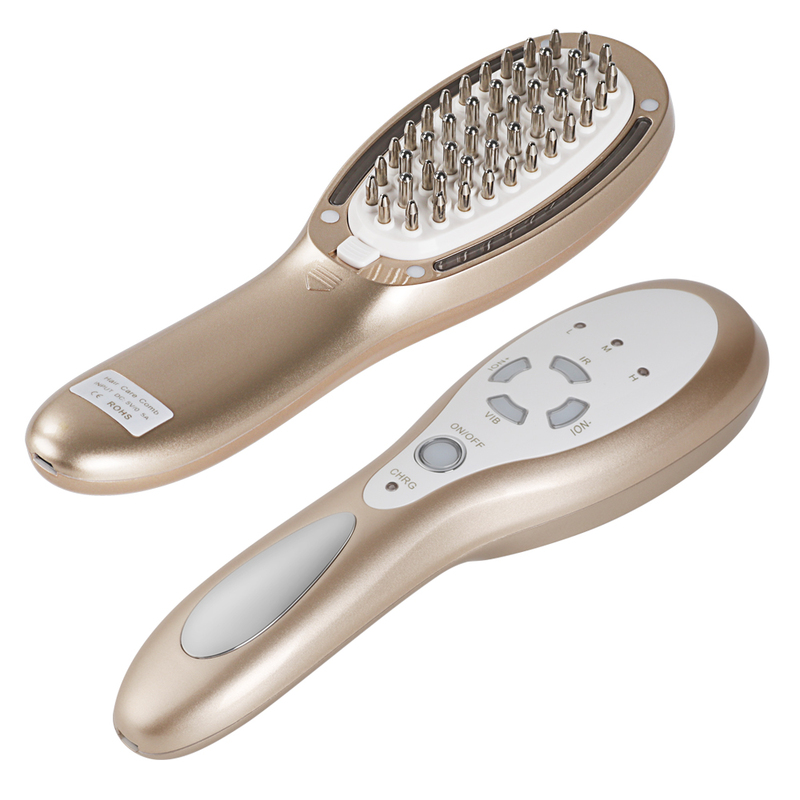 The usage is comfortable and smooth. 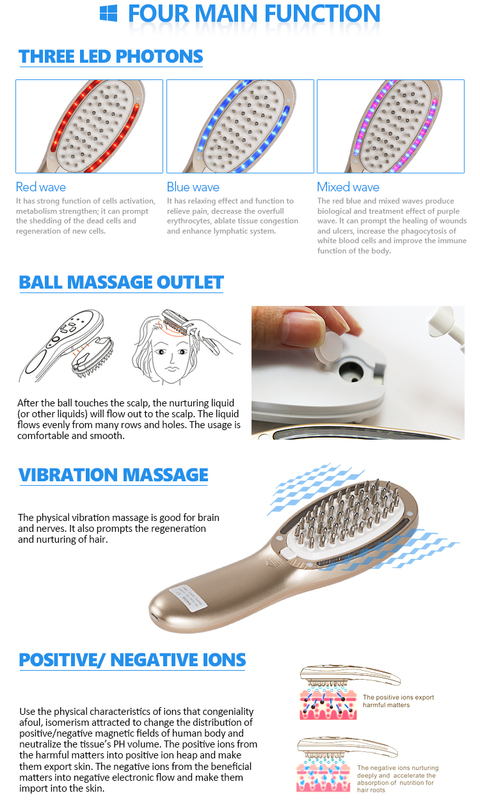 The physical vibration massage is good for brain and nerves. It also prompts the regeneration and nurturing of hair. Use the physical characteristics of ions that congeniality afoul, isomerism attracted to change the distribution of positive/negative magnetic fields of human body and neutralize the tissue’s PH volume. 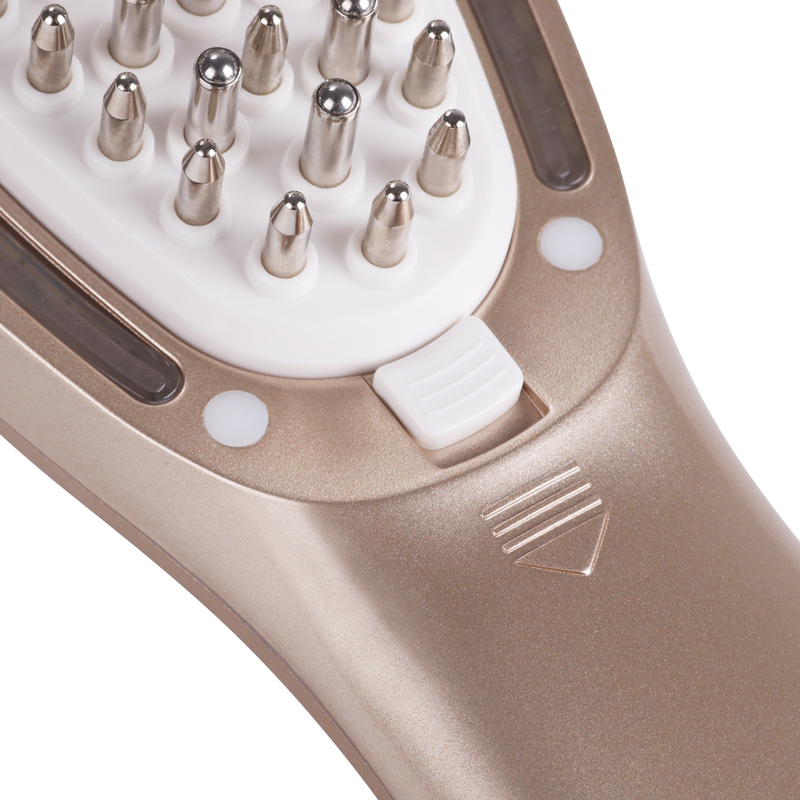 The positive ions from the harmful matters into positive ion heap and make them export skin. 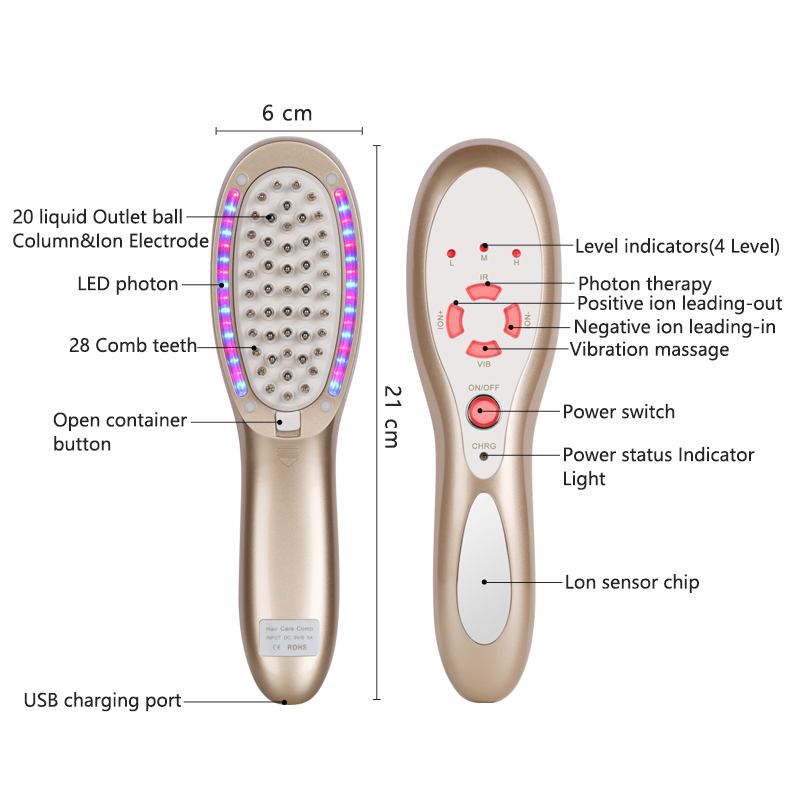 The negative ions from the beneficial matters into negative electronic flow and make them import into the skin. 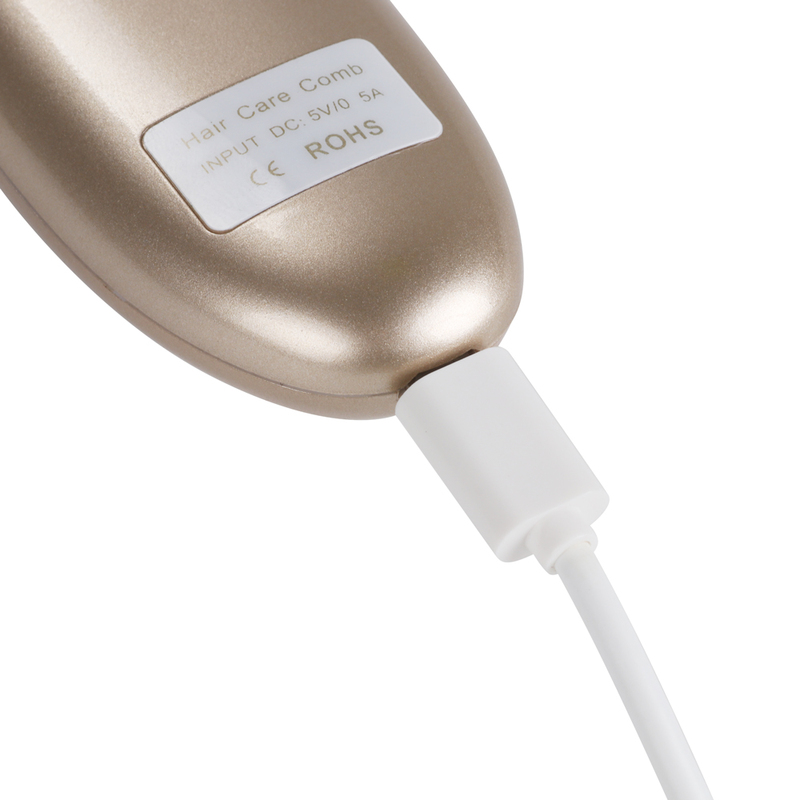 Dermatologist has put forward that, after hair loss, the size of the hair follicle has changed a lot, but the structure and the number of hair follicle hasn’t changed. 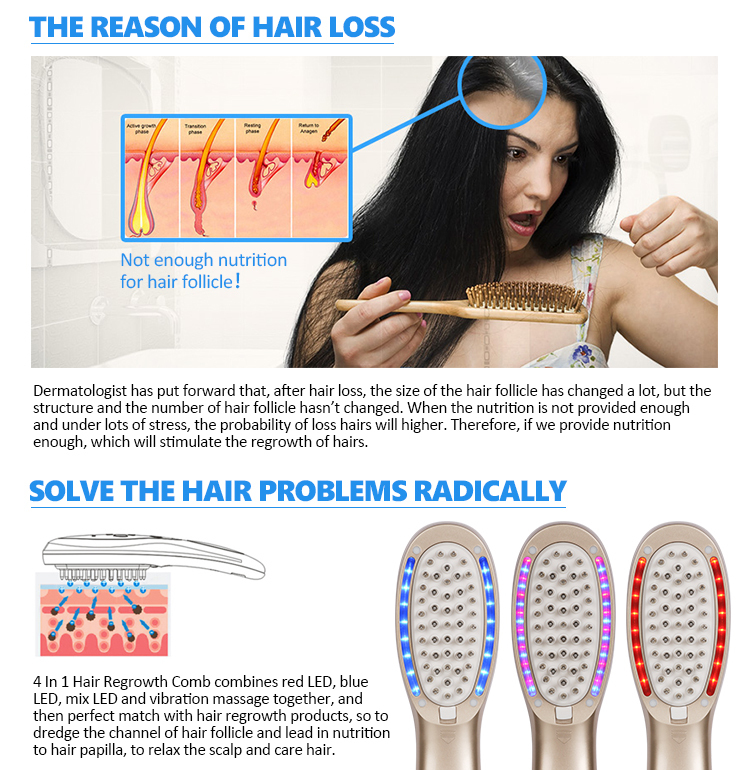 When the nutrition is not provided enough and under lots of stress, the probability of loss hairs will higher. 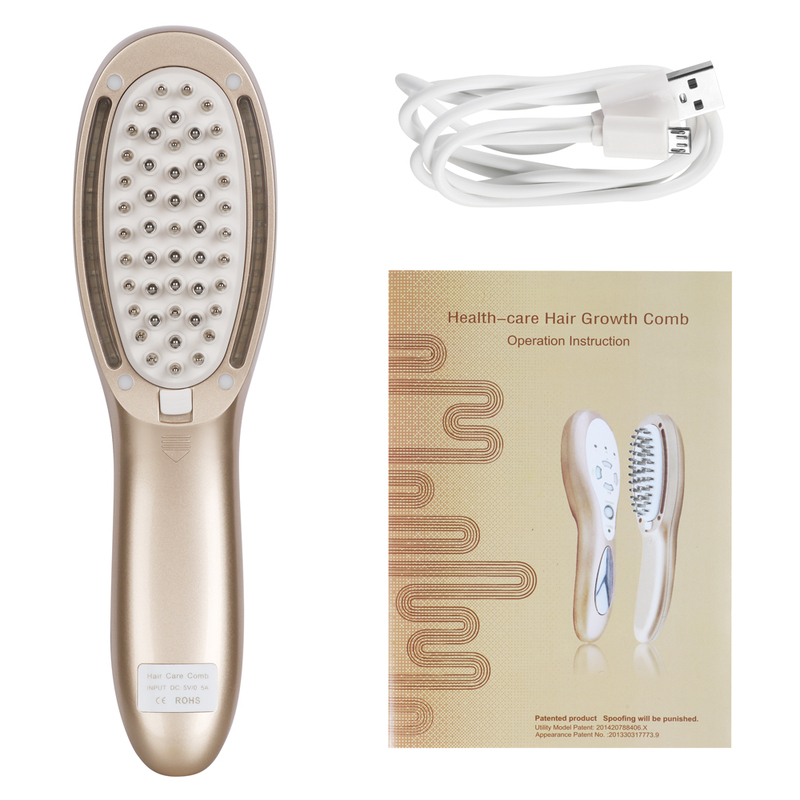 Therefore, if we provide nutrition enough, which will stimulate the regrowth of hairs. 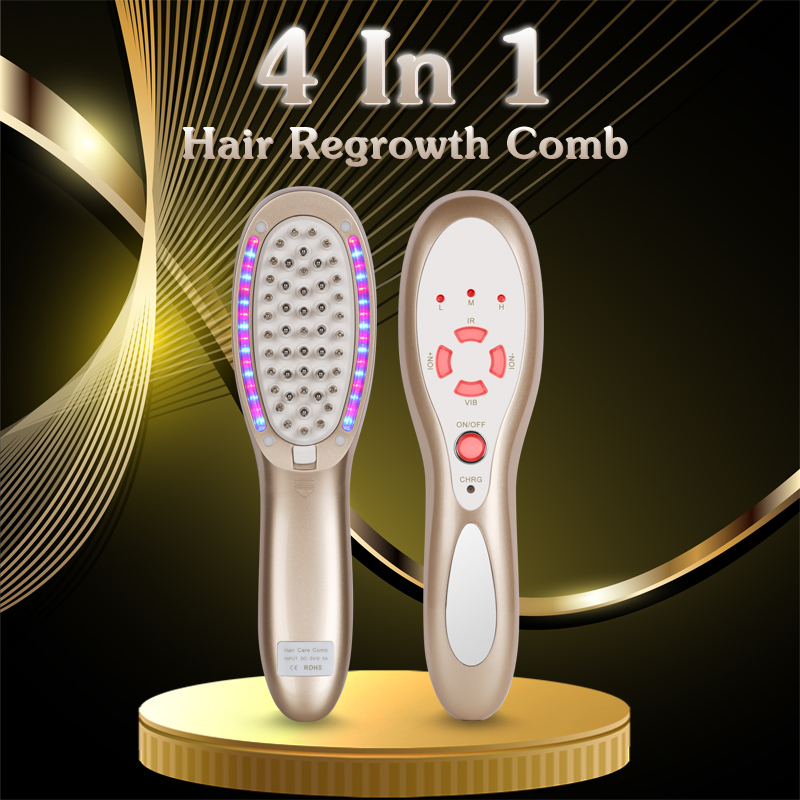 4 In 1 Hair Regrowth Comb combines red LED, blue LED, mix LED and vibration massage together, and then perfect match with hair regrowth products, so to dredge the channel of hair follicle and lead in nutrition to hair papilla, to relax the scalp and care hair. 2. Then turn on the power, choose the mode and level. 3. 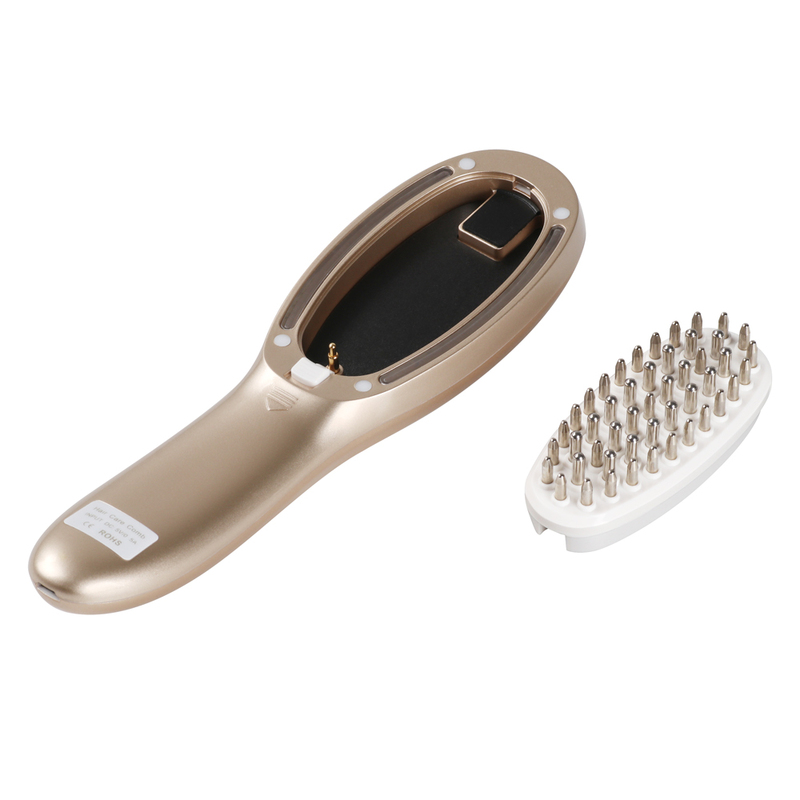 Use our hair regrowth comb touching your hair scalp, from front to the back, to nurse your hair.